When Queen Elizabeth died in 1603 AD, she left England in very good shape. Because Elizabeth had no children, she left power to her nephew James I, the son of her sister Queen Mary. James I was 37 years old. He was already king of Scotland, and by giving power to James Elizabeth was able to unite England and Scotland into one country (Great Britain), making them both stronger. Unlike his mother, James was brought up Protestant like Elizabeth. People were hoping that James would be a great ruler like Henry IV of France. But James spent a lot of time hunting and hanging out with his friends, and didn’t really work hard to take care of England and Scotland. Like the Ottoman sultans and the Iranian shah of the same time, James spent most of his time partying. He sent out some settlers to start the town of Jamestown in Virginia, but they had no good plan and most of the settlers died. Most people were just happy that England was at peace, but the rich lords were disappointed that James didn’t want to cooperate with them. They tried to overthrow James several times. The most famous time that people tried to overthrow James is Guy Fawkes‘ plot in 1605 to blow up the Houses of Parliament with James inside. But all these plots failed. James lived to be 59. 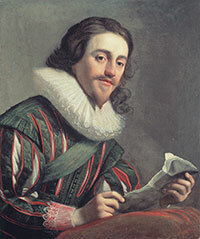 Then he died of dysentery in 1625 and left power to his son Charles I. When James died, Charles was 25 years old. 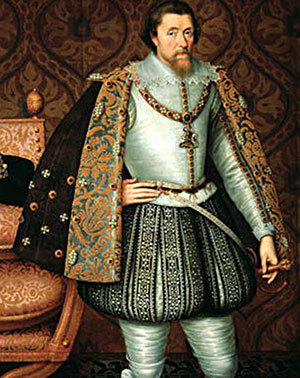 Charles saw that the great lords held more and more power in England, while the king had less power. He wanted to do what Richelieu had just done in France, and get power back into the hands of the king – he wanted to rule the way Louis XIII was ruling in France. So King Charles announced new taxes without asking Parliament, and he ordered people to change their religion. He sent out settlers to Virginia, in North America, where they forced Cherokee people off their land so the British could grow tobacco on it. He started new colonies south of Virginia, and named them the Carolinas, after himself. (Charles is Carolus in Latin; today that’s North Carolina and South Carolina.) Charles also persecuted the Puritans, so that many of them chose to leave England and settle in North America too – but not in the Carolinas! The Puritans went north to Massachusetts and forced the Iroquois off their land instead. The powerful rich men in Parliament got sick of being ignored, and in 1642 they started the English Civil War to get rid of King Charles. The Puritans took the side of Parliament too. In 1649, Oliver Cromwell, the leader of the rebels, captured King Charles and had him killed. The English lords didn’t choose a new king. Instead, they announced that Parliament would rule the country as a Commonwealth or republic. They changed the English army to be a modern standing army instead of each lord controlling his own people. Many people who had been supporters of Charles left England and moved to Cherokee land in Virginia. But the rich powerful men in Parliament weren’t used to ruling a country without a king or queen. 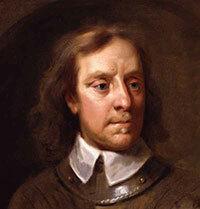 By 1653, the Commonwealth really mostly meant that Cromwell ruled the country, as if he was a king. Cite this page: Carr, K.E. Cromwell and Early Modern Britain. Quatr.us Study Guides, August 5, 2017. Web. April 23, 2019.